Visit our Actual Before/After Gallery. Imagine having a brighter, straighter, and more aesthetically pleasing smile in just two or three dental visits. This is what modern cosmetic dentistry can do for you. Dr. Wagner has been Jacksonville’s premier cosmetic dentist since 1998, helping hundreds of people unleash their smiles’ full potential. With a smile that represents your true personality, you’ll be ready to face the world with confidence and zeal. "one size fits all" approach. 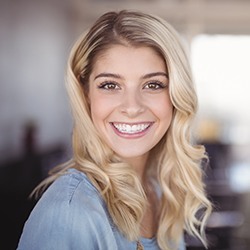 Whether you’d like to straighten your teeth, brighten your smile, or completely change your smile’s overall impression, Dr. Wagner has a solution for you. Erasing dental imperfections may be easier than you ever deemed possible. With his experience as THE Jacksonville cosmetic dentist, Dr. Wagner designs custom smile makeover plans that can accommodate any schedule or budget. He may recommend one-visit bonding to close gaps, laser teeth whitening to remove stains, or porcelain veneers to transform dull, dingy, and misaligned teeth in just two visits. If your smile appears overly uneven or “gummy” in appearance, he may also recommend gum recontouring as an effective solution that can more precisely sculpt the gum line and reveal healthy, attractive dental structure that was once hidden from view. No matter your needs, we’ll deliver results that will far exceed your expectations. Everyday factors like coffee, wine, tobacco, aging, and even genetics can leave your smile looking yellow, dull, and discolored. 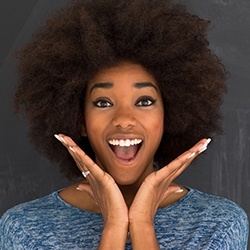 If you’re looking to turn back the clock and get a dramatically whiter set of teeth, then our professional teeth whitening treatment with Zoom Whitening is exactly what you want. With it, we can make your smile look up to 8 shades lighter in less than an hour, plus it will eliminate many kinds of stains other treatments simply leave behind. Does your smile have obvious gaps that you’d love to get rid of? Or, do your teeth have multiple flaws and you don’t know which one to fix first? With porcelain veneers, you don’t have to choose. These custom-made porcelain coverings are bonded to the front of the teeth, and they can fix/mask a wide array of imperfections at the same time to leave your smile truly sparkling. To learn if they are right for you, click on the link below. Is your smile marred by stains, chips, cracks, decay, missing teeth, or all of the above? If so, don’t worry, because the Eccella Smiles team can bring your smile back to its original glory using a Smile Makeover. Dr. Wagner & the Eccella Team offer multiple treatments combined together to give you a completely new smile that will always fill you with confidence. No matter what state your teeth are in now, it can be used to achieve true life-changing results. Do your teeth appear to be too short? Would you say that you have a “gummy” smile? Our dentists can easily fix this using a laser gum lift. 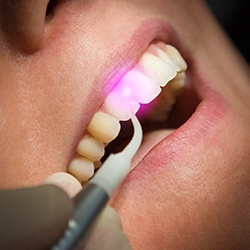 With a soft tissue laser, your dentist can painlessly remove excess gum tissue to reveal more of your natural dental structure hidden underneath, giving you that perfectly proportioned look in just one appointment. This can serve as a treatment on its own, or it could be the first step to getting porcelain veneers or a dental crown. Sometimes more invasive surgical options are needed to provide the ideal aesthetic result. We have a surgeon (Periodontist) who is a gum specialist who provides solutions on more complex cases. The goal is ideal smile design and exceptional aesthetics results. When it comes to having a beautiful smile, the shape and contour of your gums are just as important as your teeth. If the gum line is uneven, for example, it can make the teeth look misaligned or like they are very different sizes. With cosmetic gum recontouring, we can gently shape your gums so that they are even and compliment your teeth in every way, creating an overall look that is very pleasing to the eye.